When I was little, my dad had a book called How to Be Your Daughter's Daddy, and the only parts of it that I remember was a section that had a bunch of little "date" type activities for dads and daughters to do together - things like roast mini-marshmellows on toothpicks over candle flames and the stipulation that every girl needs at least three pillows on her bed. Well, if you don't count Mr. Cleaver's pillows, I have been languishing with only two pillows for years now. Well no more, says I! I had a pillow form sitting around for about a year and this weekend I gathered all the materials together and made this throw pillow. 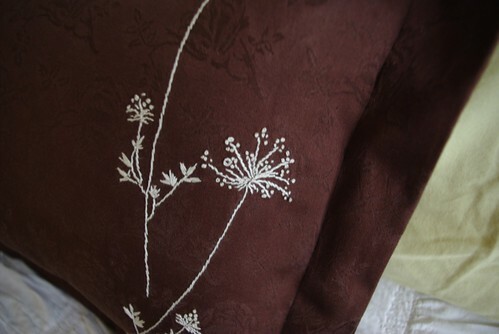 I drafted out a quick envelope back pillowcase and spent the majority of yesterday morning watching MR. Cleaver play his first tennis game of the season and doing the embroidery, which I had bookmarked for this pillow since it showed up on Sew, Mama, Sew! I definitely got to practice my french knots. 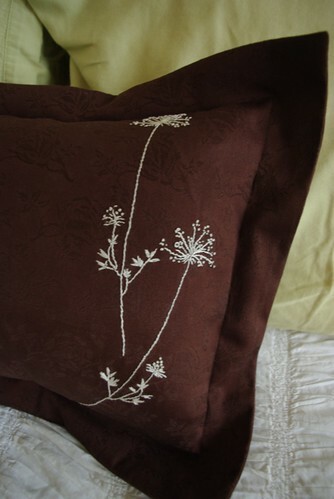 I love the way the pillow turned out and it really ties the bedding together. 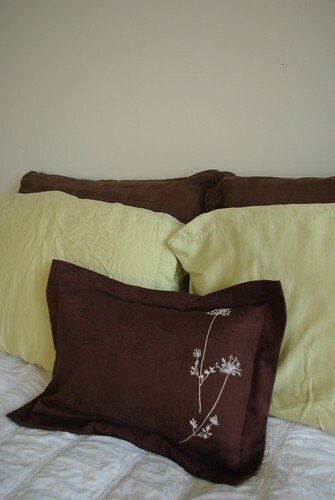 And really, it makes me feel as if I've fulfilled my girly quota on pillows.